So many who love to sing are drawn to the immediacy and essential simplicity of the music we commonly call folk music. 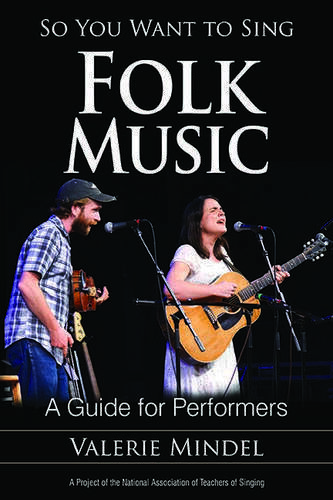 Folk music, in fact, may serve as the perfect entry point for those just starting on their singing careers because of the ways in which it side-steps the strictures of classical forms without giving up the fundamentals of professional singing techniques. In So You Want to Sing Folk Music, singer and writer Valerie Mindel demystifies this loose genre, looking at a variety of mainly American and British traditional music styles as well as those of the folk revival that continues to this day. The aim is to help the fledgling singer better understand the scope of folk music and find their voice in the genre, looking at the “how” of creating a vocal sound that reflects the individual and is true to the broader style that they want to create. The book concentrates on a range of currently popular styles in the genre, looking at specific repertories and ways of approaching them. It also looks at the current musical outlets that are available to singers, as both amateurs and professionals. Additional chapters by Scott McCoy and Wendy LeBorgne, and Matthew Edwards address universal questions of voice science and pedagogy, vocal health, and audio enhancement technology. The So You Want to Sing series is produced in partnership with the National Association of Teachers of Singing. Like all books in the series, So You Want to Sing Folk Music features online supplemental material on the NATS website. Please visit www.nats.org to access style-specific exercises, audio and video files, and additional resources. Valerie Mindel is a long-time performer and teacher of various American folk styles, including early country, old-time, bluegrass and beyond. She’s taught harmony singing classes and workshops for 20 years across the United States and abroad.